The MISTER ED show concept was derived from a series of short stories by children’s author Walter R. Brooks, which began with The Talking Horse in the September 18, 1937, issue of Liberty magazine. Brooks is otherwise best known for the Freddy the Pig series of children’s novels, which likewise featured talking animals that interact with humans. Sonia Chernus, secretary to director Arthur Lubin, introduced Lubin to the Brooks stories and is credited with developing the concept for television. 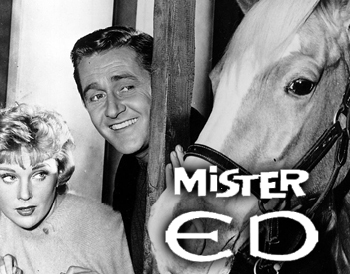 The theme song, titled “Mister Ed”, was written by the songwriting team of Jay Livingston and Ray Evans and sung by Livingston himself. The melody is derived from that of a German Romantic-era song by Emile Waldteufel. The first seven episodes used only instrumental music to open the show; thereafter the version with lyrics was used. Livingston agreed to sing the song himself until a professional singer could be found; the producers liked the songwriter’s vocals and kept them on the broadcast.